Q. What comes in each Cupcake Cutie Kit? and all the necessary toppings to create the design that is pictured. Q. Do You Bake the cupcakes in the Sleeves? A. No the Sleeves are used for decorative purposes only after the cupcake is baked. Q. 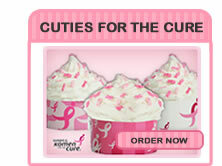 How can I get a Cupcake Cutie Kit for all my events and occasions? A. You may join our Cupcake Cutie of the month club and you will automatically receive a Cupcake Cutie Kit every month. Q. Are the Cupcakes hard to decorate? A. No, we had busy Moms and Dads in mind while coming up with each design. Everything you need is included. It 's as easy as 1, 2, 3! Q. Do the cupcakes take a long time to decorate? A. Each design takes less then 3 minutes to put together, some even less then that. Each Cupcake Cuties Kit comes complete with 24 themed wraps and all the custom toppings to complete the designated design. Easy to follow instructions and picture are included in each Cupcake Cuties Kit. Cupcake Cuties sleeves are printed with Food Safe inks. Cupcake Cuties are packaged in recyclable PET Material. Each Cupcake Cuties Kit comes packaged in an adorable box that could double as a gift box. Cupcake Cuties have a wide range of whimsical and upscale designs for many occasions including birthdays, weddings, and holidays. 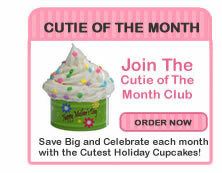 Cupcake Cuties also offers a Cupcake Cutie of the month club membership. Cupcake Cuties are easy as 1, 2 ,3 for taking your cupcake from ordinary to extraordinary! 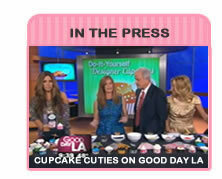 Cupcake Cuties are amazingly creative and a new way to serve cupcakes! Cupcake Cuties Sleeves Made in the USA.